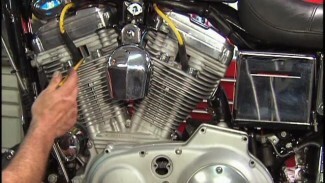 Tommy Creal walks us through removal of the stock Harley Davidson exhaust system and air cleaner assembly on this M8 touring model. Performance exhaust system, high flowing air cleaner assembly, and a tuner are some of the most common upgrades along with handlebar replacement. As always, we begin with disconnecting the battery ground cable. Remember, switch the RUN/OFF switch to RUN before removal of the main fuse to avoid setting off the bike’s security alarm. It is always important that chrome, painted, polished, or any other finished surfaces are protected with a clean cloth or towel prior to working over or near. 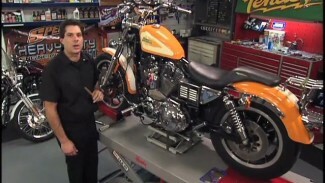 Painted components like saddlebags should be set on a towel or blanket, in a safe location after removal. Never run the risk of damaging a component when attempting a repair, maintenance, or upgrade. It is never a good feeling to find yourself being counter productive. 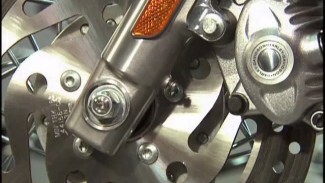 Exhaust systems are more prone to corrosion than other areas of a motorcycle. It is always important to lubricate rusted or corroded exhaust hardware and clamps prior to loosening. This not only makes removal easier, but it also helps to avoid stripping hardware or breaking screw style heat shield clamps. 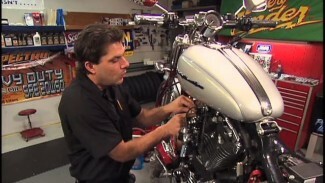 Tommy disassembles the stock Harley Davidson air cleaner assembly in preparation for a performance high flow air cleaner assembly. Although not reusing any of the stock air cleaner hardware, it is important to keep the assembly and hardware together for future reference or even, possible reinstallation. Now that we have stripped the stock Harley Davidson air cleaner and exhaust from this M8, we will lay out our new parts and prepare for our first aftermarket performance installation.